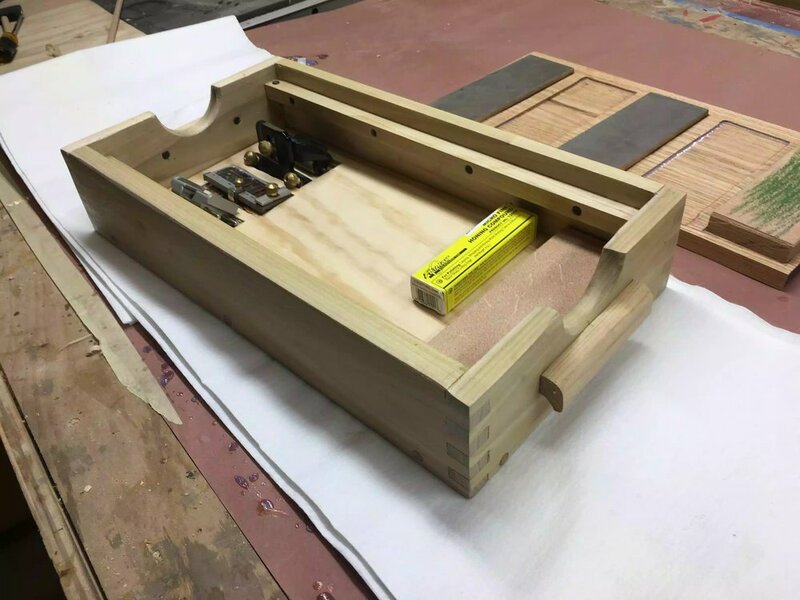 Today I finally got to finishing this project all I needed to do was to add wooden plugs to the countersunk screw holes for the base and apply a urethane finish to the entire sharpening station. I usually have some oak dowels lying around the shop but for the life of me couldn’t find any so I needed to make my own which is very easy. I used a 3/8” plug cutter in my drill press and since I had some oak scraps lying around from this project I used it. Below you can see some pictures of the process. Step 3. Was to flush cut the plugs to the surface. Cutting the plugs on the drill press. Here is a close up of the plug cutter. Here is the protruding plugs that needed to be flush cut. Finally using my flush cutting saw, I trimmed the excess off. Now that everything was done all that was left was to apply a finish, the finish I wanted to use was Minwax Poly-Crylic but by big box store didn’t have any so I choose an alternative water base polyurethane and I applied 3 coats. Here is the last of the 3 coats, applied to the top, still wet. Here is a before picture , this is before I applied the finish. This is after the finish has been applied, I love how the box joints pop. All that is needed now is to wait for the finish to dry, but here are some final pictures. I love how handy this station will be and I should have made it a long time ago, everything that I need to sharpen my tools is now in one place just the way I like it. This concludes my blog on this project, I hope you have enjoyed reading about this project as I have enjoyed making it. I will be releasing plans for this in my shop as soon as I have a chance in putting them together. Until the next time I’ll catch you later. This station is a very comfortable height for me to work on, although I might have gone over-board in its design it is extremely functional. Here is my Veritas MKII honing jig being put to good use. I really like the contrasting oak plugs that I used and also really enjoyed making the pulls, which I made from solid ash. I really love having everything that I need right at my finger tips.